Take a trip back in time. . .
Hopwood-based artist Paula Hamilton visits a collection of historic buildings. Moving or re-locating a building – and I mean a big heavy building, not a garden shed – sounds like an impossible task. But the reason for doing so is really important and has been driving the work at Avoncroft Museum in Bromsgrove for 50 years. How else would we be able to preserve precious old buildings which might otherwise be demolished and lost for ever? It all started in 1967 when the fabulous Medieval Town House was rescued from Bromsgrove town centre and reconstructed at Avoncroft. On the day that I visited the museum, an appropriately-dressed lady was about to cook scones over an open fire in the Town House; I didn’t stay long enough to taste the scones and I have a feeling they might have tasted smoky but certainly authentic! There are more than 25 buildings to visit, from medieval structures up to the post war pre-fabs; I will mention what I think are some of the highlights. 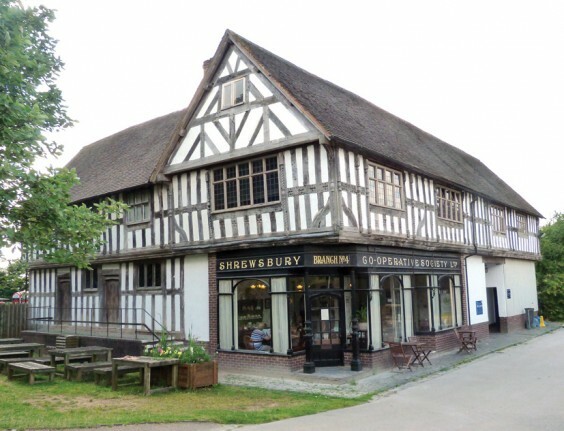 Near the start of the tour is the Counting House which was part of the new Bromsgrove Cattle Market. Its peak was during the 1930s when hundreds of cattle, sheep and pigs were sold there daily. Sadly, the last market took place in 1972, rendering the pretty, octagonal Counting House redundant. The Avoncroft Windmill is simply amazing, perhaps the star of the show. Moved from Tanworth in Arden, it now stands on a site that overlooks our beautiful countryside and is completely perfect and quite majestic. Volunteers get the windmill going regularly, weather permitting, but checking the website for dates and times is essential. Then there’s the National Telephone Kiosk Collection, containing 32 telephone kiosks and including every type used from 1912 to the present day. This may sound nerdy but it’s great and now that telephone kiosks are almost things of the past, it’s wonderful to see examples dating back decades. Some of the phones ring and can be answered; and then there’s a blue Tardis-style kiosk – my favourite and great for all Dr Who fans. The Threshing Barn, where grain was beaten to separate the wheat from the chaff, is another spectacular building and placed conveniently close to the Granary where cereals would have been stored after threshing. Very relevant to the history of the Black Country and dating from the 1850s is the Chainshop, where chains were made by a team of men at their forges until as recently as 1969. This feels like a real taste of the Black Country and was indeed transplanted from Cradley. Children will be drawn like magnets to the model train which runs every Tuesday throughout the summer and up until October. I haven’t mentioned that the buildings and structures at Avoncroft Museum are set in delightful grounds, 19 acres in all. There is an orchard with heritage fruit trees, a wildlife pond, a sensory garden and cottage gardens adjoining some of the houses, which are planted and maintained in keeping with the period they represent. Nineteen acres sounds huge but the ground is easy going and the site is compact. However, I did feel in need of a visit to the Edwardian Tea Room (above) before I left. This is housed in a lovely Co-operative Society building which has a delightfully retro feel to it, although the coffee and food is well up to today’s standards. You can book for a proper High Tea of sandwiches, scones and cake! * Something else that’s wonderful, and on until September 21 at Birmingham Museum & Art Gallery, is The Wonderful World of Rowland Emett, showing this Birmingham-born inventor’s marvellous machines. The quirky moving machines, or automata as they are known, include items from the film Chitty Chitty Bang Bang, fantastical flying machines, and a bicycle for cycling across the moon. This, like visiting Avoncroft Museum, should not be missed! What do you think? Share your views by typing in the box below. Commenting is not available in this channel entry.